Welcome to our website – I hope this has inspired you and you have realised that Go Godalming is not just a name but a vibrant organisation with its heartbeat in our Town of Godalming. When we were set up some twenty years ago, the vision was to form an organisation that did things – like putting on Town days or being a 'champion' for our visitors and tourists. Since then, lots of different bodies have taken on these roles and responsibilities but Go Godalming remains a central hub in our community. We now oversee five main organisations as shown on our 'home' page – we have many affiliated groups and member companies as part of our association, not to mention private individuals as well. As chairman, I am passionate about our Town & community and whatever we, as an association, can do to improve the lives of the twenty thousand or so inhabitants who live here, we will try to do. We are not bound by local government bureaucracy – we are totally independent and as such, are listened to and are well respected. So, why join us? Why join a well-run group of people who care about our Town and the community they live in? 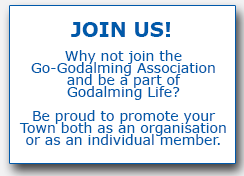 We can't change the world but we can and do have a voice... so why not become a member of 'The Go Godalming Association' and maybe make a difference? You can join as an organisation or as an individual member and have the choice of either paying us by cheque or by standing order. The form is activated so that you can type on it (but you will need to download to your computer first) and then print it out - or simply print it out and fill it in in black ink using your neatest handwriting!